Afghan President Ashraf Ghani and his electoral rival Abdullah Abdullah are on a five-day visit to the US to discuss greater American military presence, continuation of aid and other benefits the six month-old Afghan government is seeking from Washington. In September last year, Ghani and Abdullah agreed to form a unity deal after weeks of contesting the position of Afghan president. This followed a tense election marred by numerous allegations of fraud. 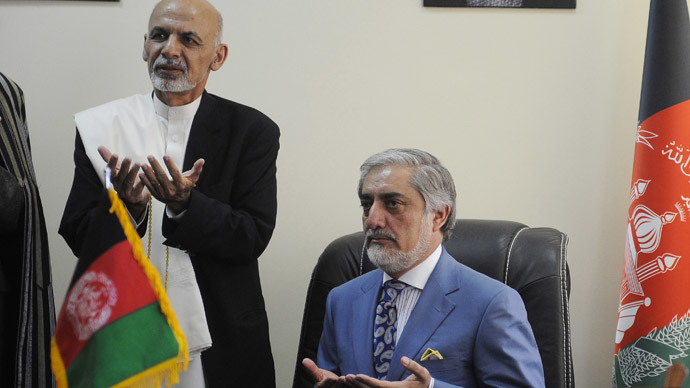 Ghani eventually became president, with Abdullah assuming the newly-created position of chief executive officer. Six months on, Ghani is taking his first foreign trip as the Afghan president – to the United States – with Abdullah accompanying him. The five-day program starting on Monday includes meetings with President Barack Obama, Secretary of State John Kerry, Defense Secretary Ashton Carter, Treasury Secretary Jacob Lew and other senior US officials. The key point of the visit is expected to be confirmation that Washington will again postpone withdrawal of its troops from Afghanistan, further prolonging the longest war the US has ever fought. The latest schedule provided for halving the almost 10,000-strong American force currently deployed in Afghanistan by the end of 2015 and an almost-complete withdrawal next year. In November last year, the Obama administration broadened the scope of missions that the US troops may perform in Afghanistan to include direct combat operations. And over the past few months for Afghan and US officials hinted that the withdrawal deadlines would be pushed back, leaving the current 10,000 troops for 18 months to come. This would also require keeping open US bases in Kandahar and Jalalabad beyond 2015, according to Reuters. The move might be necessary, considering that with warmer weather arriving soon, the Taliban is expected to launch a spring offensive, while Ghani’s government remains fractured by the ongoing power struggle between him and Abdullah. “It’s doubtful whether the Afghan security forces and the loyal militias would be able to sustain control without some US forces there,” Russ Baker, editor-in-chief of Whowhatwhy.com news website told RT. “A lot of those people are warlords in their own right. There is tremendous amount of corruption, the control of the drug trade, tremendously lucrative contracts, the billions of dollars of foreign aid that had gone missing,” he added. Ghani will also seek renewed US commitments to provide financial help to his government. “The meetings in the US will focus on another key point: the financial support to Afghanistan, which has been secured until 2017, but needs to be confirmed for the following five years,” a senior Afghan official told AFP on condition of anonymity. Washington is interested in staying in Afghanistan just like Kabul is interested in keeping it in. While the US public is weary of the war, American presence in Afghanistan is strategically important. “[In Afghanistan] you sit right on the other side of Iran. That’s a big issue. You also contemplate how close you are to China. The Americans have regularly tried to have outposts all over the world to watch everybody else,” former CIA agent Jack Rice told RT. For Washington, Ghani is a more suitable negotiating partner than his predecessor Hamid Karzai. In the last days of his decade of rule, Karzai openly said that US presence in Afghanistan was a greater threat than the Taliban. He sought peace talks with the militant movement while refusing to sign a key security deal with the US, saying that would be his successor’s decision. Ghani is a reputed technocrat rather than a charismatic natural politician and has strong ties with the US, where he studied and lived for 15 years while working for the World Bank. “He’s a creature of Washington, a creature of Aspen and Davos. He’s extremely comfortable moving in these circles,” Doug Ollivant, a former National Security Council member under Obama and Bush administrations, described Ghani for the New York Times. The expected extension of US troops’ presence however would be a temporary measure and Ghani’s effort to consolidate his power over the past months included intensive talks with other key players. According to Los Angeles Times, Ghani agreed with the Taliban to hold a series of peace talks, with a third round to be held in Mecca. He mended rifts with neighboring Pakistan, where a recent bloody militant attack on school for military families reportedly disrupted long-time ties between the Taliban and certain figures in the intelligence community. He also dealt with China, handing over suspected Uighur militants, who used Afghanistan as a safe haven. Providing security in Afghanistan would be a necessary condition for attracting foreign investment into the poor country, which sits atop tremendously rich mineral deposits. In January, a US-Afghan report announced discovering $3 trillion-worth of reserves, including copper, lithium, zinc and dozens of others. But lack of stability and endemic corruption make taping those riches extremely risky.